The faculty of Applied Medical Sciences. The faculty of Arts and Design. The faculty of Financial and Administrative Sciences. Applicants should firstly pay for the application form only which has to be filled and submitted to the university’s Office of Admissions and Registration. Applicants are required to visit the university right after the exam results are out to bring the original documents required for admission and complete the admission procedures according to the regulations set by the Ministry of Higher Education. 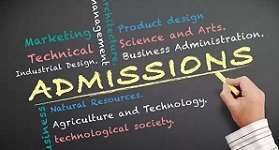 Applicants should bring the original documents required for admission to finalize the admission procedures till the results of the minimum grades set by the Ministry of Higher Education for admission in Pharos University are out. Thanaweya Amma original certificate or a statement of the student’s marks stamped from the educational administration of his/her school. A copy of the Arabian secondary school certificate and an official document stating that the student is currently enrolled in another university. Passport size photos (6 *4). Military Service Form (Namouzag 2 Gond) from the Security Directorate or a police station (for male students only). Original passport (For the International Students). A letter of consent for applying to Pharos University from the student’s affiliated embassy (For the International Students). 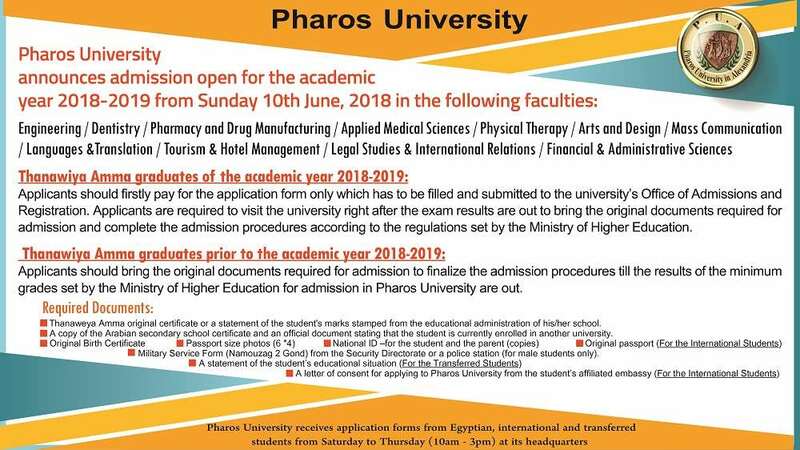 Pharos University receives application forms from Egyptian, international and transferred students from Saturday to Thursday (10am – 3pm) at its headquarters.